Bird Food Storage Containers - DISCOUNTED. Retain the freshness of your bird food and extend the shelf life. Excellent for preventing bugs in food. 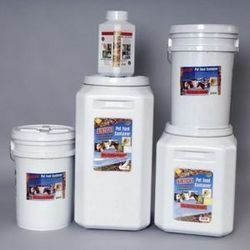 Food storage containers can extend the shelf-life of your pet's food and hinder the intrusion of insects and rodents. The Van Ness Plastic Pet Treat Storage Container is tested for durability, functionality, and safety to assure you that the product meets the needs of your pet. 5 lb capacity - 10" x 11" x 6.6"
10 lb capacity - 9" x 10.5" x 12"
25 lb capacity - 14" x 14" x 16"
50 lb capacity - 16" x 18" x 20.5"